My grandmother had a heart attack last week. Don’t worry, it’s not her time yet. She’s going on a cruise next month. When a doctor in the cardiac unit at UMass Medical told her the cruise might not be a possibility, she put the two fingers next to her thumb together and made like she was pointing a gun. Nope. No mild heart attack will stop her. Sasha and I each have a grandmother left. Mine is maternal, his paternal. They are both 87. Sasha’s grandmother had a birthday party this weekend. I have little context from which to judge or compare, but I would say this was a fairly “standard” Brighton Beach party. Four hours of drinking, eating (and eating and eating) and drinking (and drinking) and fun. I mean, as much fun as you can have with limited Russian language. Sasha mentioned his grandmother doesn’t like to take walks around Brighton Beach. Why not? Well, because there are old people. People her age. Lots. She doesn’t want to hang out with them. I watched her face and heard her tone of voice when describing this, and let me tell you something, these old people just aren’t for her. 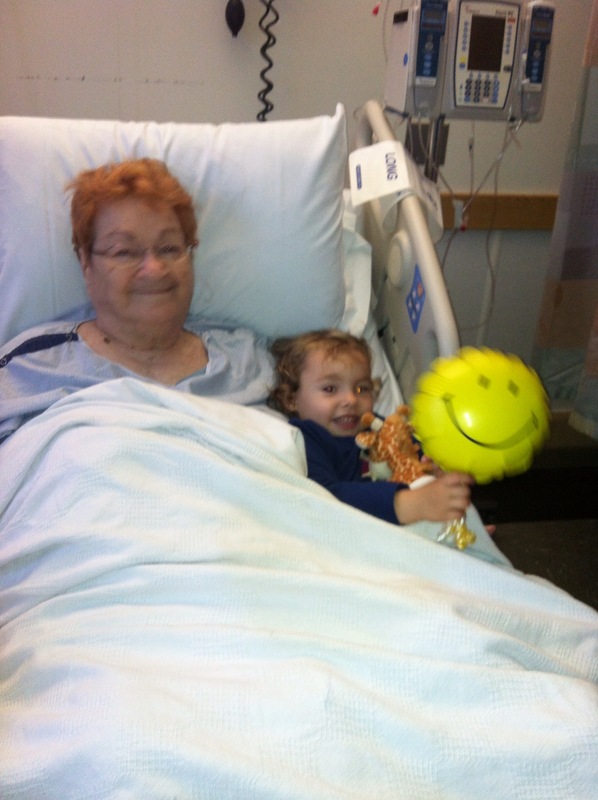 After our visit to the hospital, Liron’s visit was all Bubie talked about. It really brightened her spirits. Aging is a recurring theme here in IWHMC, as is the theme of family, grandmothers included. 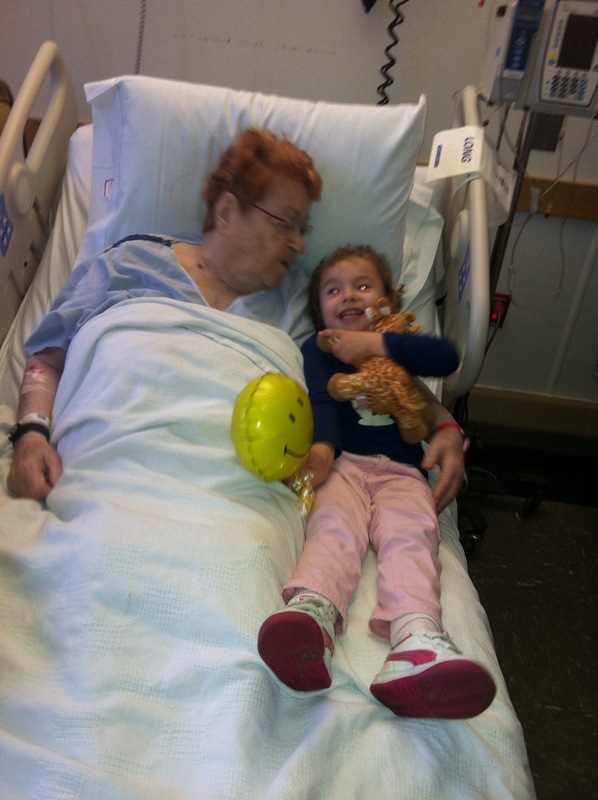 I’m glad that Liron is able to form relationships with two wonderful great-grandmothers. I hope she has many years to come with both of them, and that one day she will retain great memories of them. In the meantime, the old ladies can get a thrill from hanging out with a young chick. There’s nothing like can-do spirit in the older generation and whatever-it-is in the young ( innocence and spontaneity?). It’s beyond special. I’m wishing Bubie a speedy recovery and “Bon Voyage!” (Hope that’s part of Bubie’s vocabulary.) No doubt she’ll be the life of the party on the cruise. Thank you Susan! Her recovery has been fantastic so far. I hope she recovers soon! So wonderful that your daughter was so sweet. Sometimes hospitals can be intimidating for ALL of us! Thanks. Yes, hospitals can be intimidating. For some reason Liron seems to enjoy them. I guess shes used to more controlled chaos since we live in a little, busy city. That’s so great! My daughter didn’t do the best around my grandpa, so I went solo to visit him in the hospital and be with him and the family as he passed. She’s better with my one remaining Grandma, but still has her moments!